Tea in desserts, on the other hand, I dig! A LOT. Like these earl grey cookies, earl grey ice cream or matcha cake. Heaven. 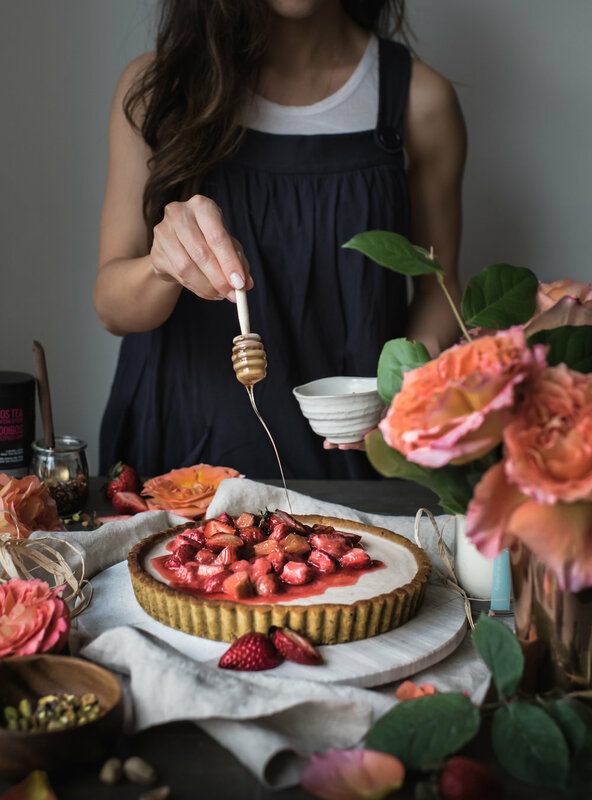 So it is no surprise this Rooibos Chai Panna Cotta Tart with Honeyed Strawberry Rhubarb Compote is totally my jam. The only surprise is why I didn't think of it sooner. Everyone I served it to thoroughly enjoyed it too! Weeell if I'm being honest, everyone except my 4 year old who ate only the tart crust and "saved" the panna cotta part for her mama. But I can't blame her for loving the crust - it's so dope. The tart crust is made with pistachios and almond flour so it's got a nutty richness that I love in a crust. It is gluten-free and yet it has a firm bite the way traditional (wheat flour) crusts do, without that slight softness (sogginess?) that characterizes certain gluten-free crust recipes i.e. ones made with dates, oats etc. The dough is easy to handle too and bakes up sturdy so there is no worry about it crumbling when you go to unmold. I think I'm ready to declare it my favorite gluten-free tart crust thus far. And I've made a few. When I opened my PC Black Label Black Box this month and saw the PC Black Label Rooibos Tea with Chai Spices Loose Leaf Tea Blend, I knew right away that was the ingredient I wanted to highlight in a dessert recipe. Specifically, my tastebuds wanted something where the tea first steeps in milk (coconut milk in this case) to impart the fruity, sweet and smooth flavors of Rooibos and also the warming chai spices of cardomom, cinnamon, etc. I concluded it had to be either ice cream or panna cotta for sure. And that was my jumping off point for this tart! Honey is used as the sweetener throughout the recipe to play off the slight honeyed-sweetness of Rooibos. 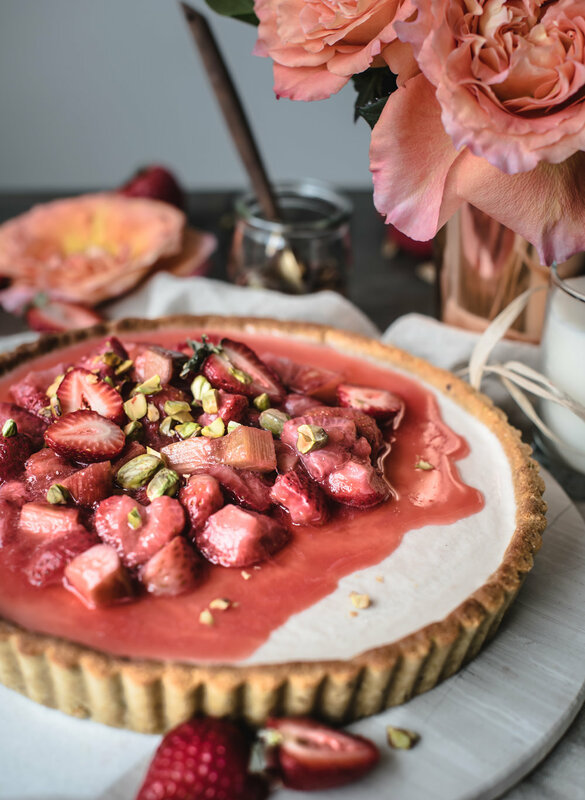 And with Spring in the air, a strawberry rhubarb topping seemed like the perfect finish. Ya feeling this? Besides the Rooibos tea which I selected for this recipe feature, there was also a PC Black Label Pistachio Ice Cream arriving at the perfect moment when the weather fiiinally warmed up here in Toronto, and a PC Black Label Gorganzola Dolce Soft Blue-Veined Cheese, which pleased my husband very much as he is an avid lover of blue cheeses - the funkier the better. Since I don't buy dairy for home cooking anymore, he gets to enjoy this as a treat on salads and on sandwiches and oh boy would he love it all melt-y on a sizzling steak since it is officially grilling season. 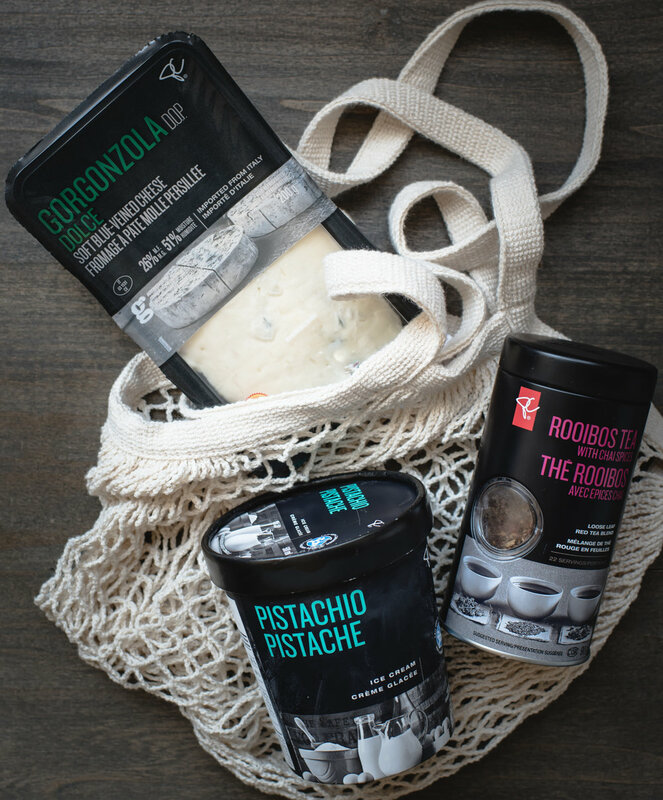 Whether you’re a home chef or an aspiring foodie, the PC Black Label Collection helps you unleash your culinary curiosity to create unexpected food experiences. Explore the entire collection and be inspired to #PlayWithYourFood at pc.ca/blacklabel. **GIVEAWAY CLOSED** To help you explore new tastes and flavors of the collection, enter to win your own PC Black Label black box in June! That's right, you can open up the June black box just like me and be surprised with three ingredients from their collection to play with in your own kitchen. Scroll down for the deets. **Giveaway Closed** PC Black Label Collection June Black Box Instagram Giveaway! I'll be posting the giveaway details on my Instagram account @saltnpepperhere the morning of Friday, May 18, 2018. 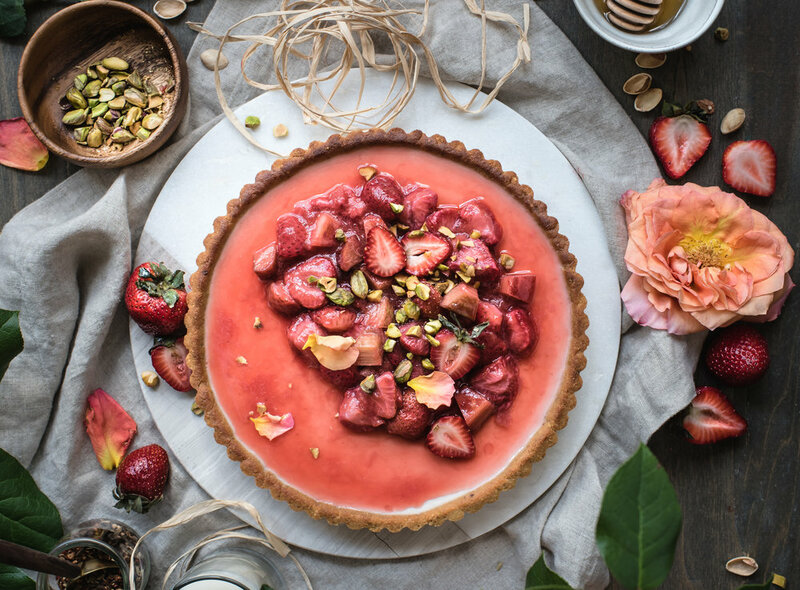 Head over there and find the post of this Rooibos Chai Panna Cotta Tart to enter via the comments. Giveaway is open for entries commencing when the giveaway is announced on Instagram until 11:59PM EST Wednesday, May 23, 2018. To enter, follow the instructions in the Instagram post caption. The winner will be chosen randomly on the morning of Thursday, May 24, 2018 and contacted via Instagram direct message. If the winner does not respond within 48 hours to claim the prize, we reserve the right to select a new winner. Giveaway is open to residents of Canada only. This giveaway is unaffiliated with Instagram. Sound good? Sound good. Now head over here to enter and we could be opening up our June boxes together! The Almond-Pistachio Tart Crust can be made and pressed into the tart pan ahead of time, and baked off later when you need it. 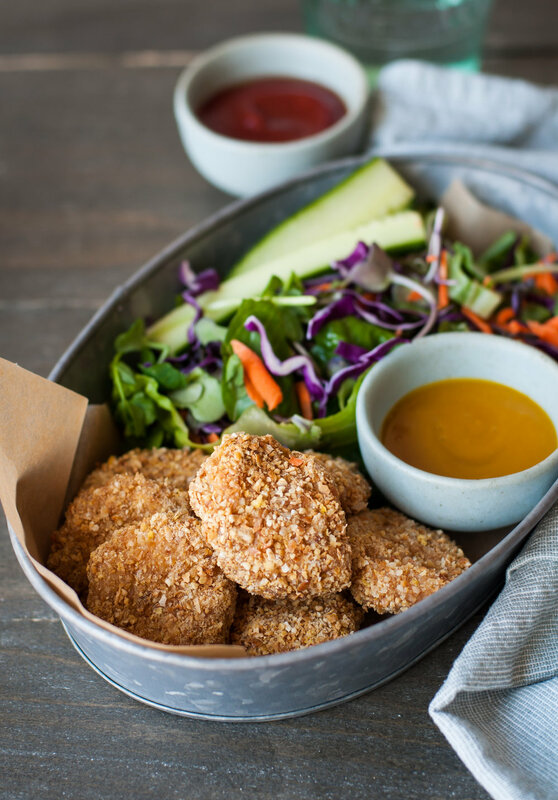 Keep it tightly wrapped in the fridge a day or overnight, or freeze longer. Bake as directed. 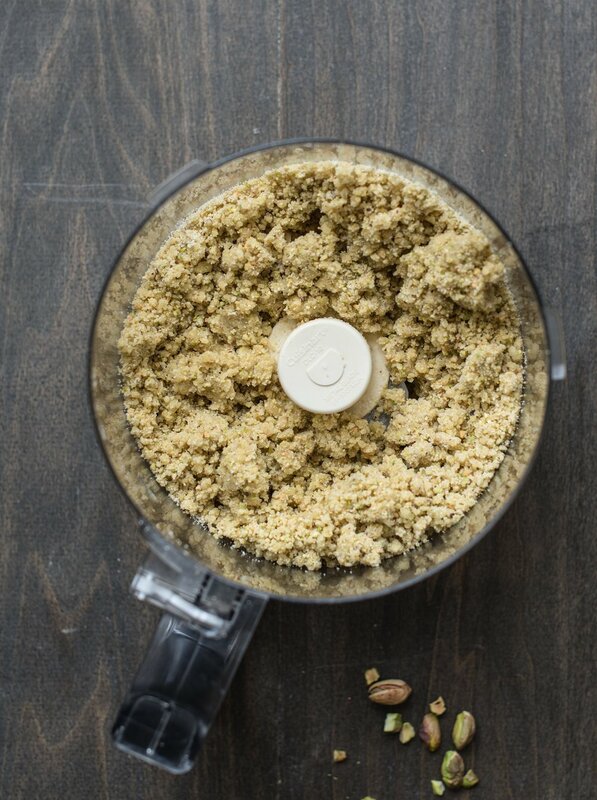 In a food processor (or high speed blender works too), short-pulse the pistachios, coconut flour and salt until you achieve a fine meal. Add the remaining tart crust ingredients (almond flour, coconut oil, honey and egg) and pulse until combined and you have consistency of very wet sand (see image in the blog post for reference). To test if the dough is ready, grab a clump of dough and press it between your fingers. If the dough sticks and holds together, it is ready. If you find that it is too dry you can add just a teeny bit of water (maybe 1 tsp) and pulse a few times to incorporate. Dump the dough onto your 9" tart pan and press with your fingers evenly on the bottom and up the sides. Spend a bit of time on this step to ensure dough is evenly spread, making sure to press into the sides to get it into the fluted grooves and also there is a good amount on the "walls" so that it is sturdy later when removing the crust from the tart pan after baking. Bake for 16-18 minutes, or until the crust looks golden brown and the sides have just pulled away from the pan. Cool fully on a wire rack before filling. Place coconut milk, rooibos tea blend and the whole vanilla pod into a small pot and bring to a simmer (but not boil) and keep it on a gentle simmer for 5 minutes. Remove from heat and let it infuse for 15 minutes. Strain out the tea leaves and pod. Put the pod aside and discard the leaves. Wash the pot and place the strained coconut milk back into it. Add the honey (I used 3 tbsp for a mild sweet taste but have a taste and feel free to add more to your taste). Sprinkle the gelatin powder all over. Allow to sit 5 minutes. Meanwhile cut the vanilla pod along the entire length to open it up and scrape the vanilla seeds into the coconut milk mixture. Bring the pot back to a gentle simmer (again do not boil) and stir until the gelatin powder is fully dissolved. Remove from heat and allow the mixture to cool. I put the pot in an ice water bath to cool it quickly i.e. place it in a larger vessel filled with water and ice cubes. Once the filling has cooled to luke warm, pour it into the fully cooled tart crust and place the tart in the fridge to set, approximately 1.5-2 hours. You can leave it to set overnight if that's more convenient (the tart crust begins the soften over time but still excellent). Put the chopped rhubarb, honey, water and ginger in a small pot and bring to a gentle simmer and cook the rhubarb until tender (just when the crunch is gone) ~4-5 minutes and remove it from heat. Discard the ginger slice. Mix in the chopped strawberries. Set aside to cool. Remove the tart from the tart pan and place it on a cake stand or serving plate. Spoon the Honeyed Strawberry Rhubarb Compote over top (if you have extra, save it to eat with yogurt or chia pudding etc). Garnish with chopped pistachios and an additional drizzle of honey if you desire.